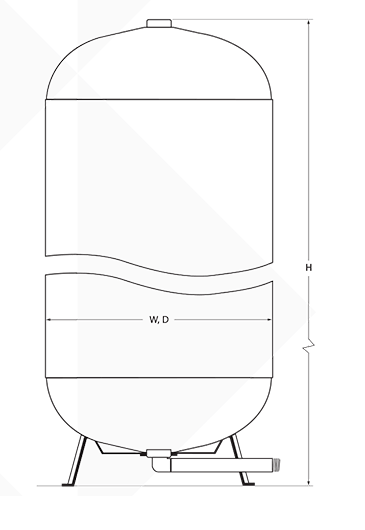 Install a properly-sized pressure relief value to protect the tank from over-pressurization. The pressure relief setting should be less than the maximum rated operating pressure of the tank. To ensure adequate flow and pressure to the water using equipment, do not reduce piping/tubing size between storage tank and distribution plumbing. Piping/tubing size from the RO unit to the storage tank can be smaller than the distribution piping/tubing from the storage tank to the water-using equipment. Product water tubing/piping and fittings should be suitable for use with high purity water. Select a location capable of supporting the normal operating weight of the tank with a safety factor of at least 2 times. Lower pre charge pressures allow the storage tank to accept more water, but water pressure diminishes more rapidly as water is drawn. Higher pre charge pressure allow the storage tank to accept less water, but water pressure diminishes less rapidly as water is drawn. Rapid on-off cycling of RO system may indicate insufficient pre-charge pressure. Drain water from tank and check pre-charge, then adjust as necessary. due to take effect in January 2014.